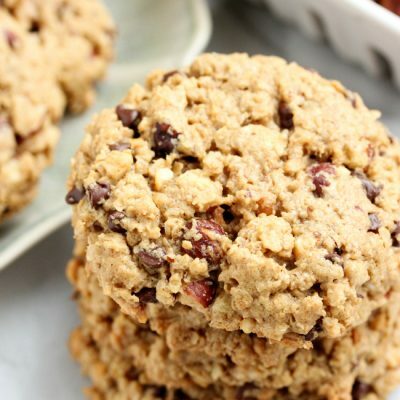 Peanut butter chocolate hazelnut oatmeal cookies are bursting with your favorite cookie ingredients all in one cookie! Do you want to lick the screen? I don’t know what it is but every couple months, I stare into my pantry and get this overwhelming feeling. And then I start to get really antsy. And then I literally take everything out of it and start chucking things in the trash that are either expired or something I don’t use anymore. And then once I’m done, I look at what I’ve reorganized and breathe and suddenly feel so much better. It’s amazing how much you can stuff in a pantry and never see again. It’s also amazing how much you FIND when you clean it out. Just last night, I went to the store to buy shredded coconut flakes. I bought two large bags for a project I’m doing this weekend. What do I find while cleaning the pantry? Oh, a large bag of shredded coconut flakes. Of course! These cookies are kind of like cleaning out the pantry. I feel like there’s so much in these cookies that’s it’s like throwing all your pantry extras in here. You know, kinda like the clean the fridge dinner that you do every now and then with everything that’s about to go bad. 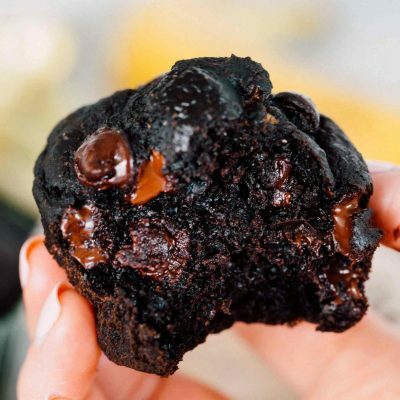 But this cookie isn’t exactly made with stuff that’s about to go bad, it’s just made with a bunch of ingredients but that’s what MAKES this cookie SO good. If you’re into crunchy textures, nuts, oats, and a bunch of peanut butter, then this cookie has your name written all over it. I’m a die-hard lover of hazelnuts. I’ve always been. Hazelnut syrup, hazelnut creamer, hazelnut everything. And yet I’ve never baked with hazelnuts before. Such a shame. Until now. I just love them in everything! Especially cookies. Did I mention how obsessed I am with these cookies? Well, I am. They’re so chunky and every bite has a bit of oomph to it. In the bowl of a stand mixer fitted with the paddle attachment, cream together butter and sugars for 2 minutes until light and fluffy. Then add in the eggs, beating well after each egg, then finally the vanilla extract and beat for 2 more minutes. Add the peanut butter and baking soda and mix until well incorporated. Then add the oats, hazelnuts, and chocolate chips. If it seems like your mixer is straining a bit, you can stop it and do it by hand, but it should be ok with the mixer. Using a large cookie scoop, drop dough onto lined baking sheets and gently press down to flatten the tops with a fork. Bake for 13-15 minutes depending on how large your cookies are. You're looking for the edges to be slightly brown and crisp. Let cool on baking sheet for 5 minutes then move to a wire cooling rack to cool completely. OMG stop these look too delicious!!! I just wish hazelnuts weren’t so expensive! Trader Joe’s, if you have one!! They sell a huge bag and I think it was only $7. I’m the same, I’m overdue a clear out! the texture of these cookies sound great! These look to die for! Ive never had hazelnuts in cookies but I now want to run out and get them just to make these! YUM! I just cleaned out my pantry earlier this week too. I hate when it doesn’t seem organized. Now if I could just keep it that way. These cookies look amazing! I can see why you are obsessed with them. Love EVERYTHING about these babies! These look yummy! Do you think I could freeze them? 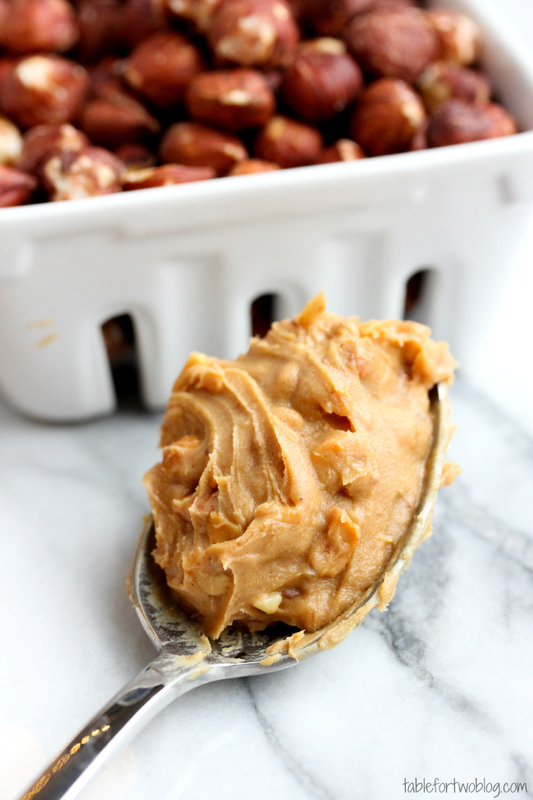 YES, I am a huge fan of “clean out the pantry” recipes, so why not do the same with dessert?? Great thought. And the chunkier the cookie, the better. I’ve never combined PB AND Hazelnuts. Looks like I’ve been missing out! Oh my goodness — your closeups are too irresistible! These look amazing! I can see why you are obsessed with these! I love EVERYTHING about these cookies. I guess because they are everything-cookies. I always love those best. Lots of textures and crunch and different flavors. And….I also adore hazelnuts! Ha! I do the same thing. We have some funny meals that come out of “clean out the pantry” day. I love these cookies. Oatmeal are my all-time favorite! yes I did want to lick the screen :) I overbuy and crowd my pantry all the time. I recently did a major clean out too and found like 9 bags of brown sugar and more cornmeal than I will ever use in a life time. I gotta get more organized! Cookies are phenomenal. This is totally weird, but the exact same thing happened to me last night too! I went to the store to buy coconut flakes because I am making cookies this weekend. Well, came home to clean out the pantry….I had TWO bags in the dang pantry! ERRRRR. These cookies look amazing! And good call on halving the pb amount:) Also, apparently we both got the hazelnut memo today! Have a great weekend! JULIE! These cookies…?! Ah, I need them! Hazelnuts are my favorite in baked goods. 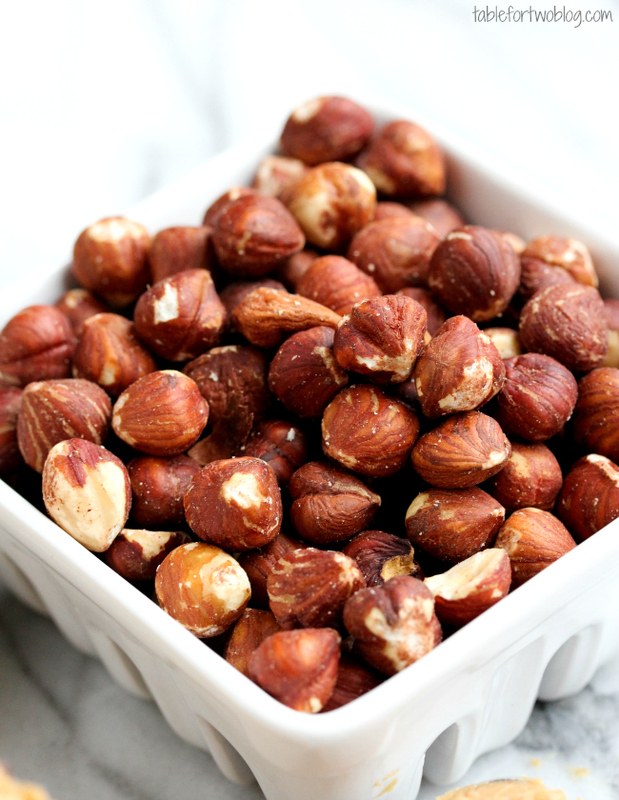 All of my favorites and hazelnuts – a new obsession I’m dying to use more after a recent trip to Oregon! We cleaned out our pantry over Christmas break – so liberating! Love to just open the door, and know what is in there, and have everything in its place! hazelnuts and oatmeal cookies – 2 of my favorite things! Do you want to talk about how I literally eat spoonfulls of peanut butter everyday? It’s a surprise and shock I’m not morbidly obese. And hazelnuts? I’ve never used them but am willing to try based on these cookies! I do the same thing with my pantry! Absolutely love these cookies! I did the same thing last night!! Freud container sent me 24 large jars and 12 mason jars and I dug out my entire pantry and throw away an ungodly nunmber of ziplock bags and WHY did I have 5 bags of almonds?? Oh, yeah, because it was such a mess I couldn’t find anything and I just kept buying more. 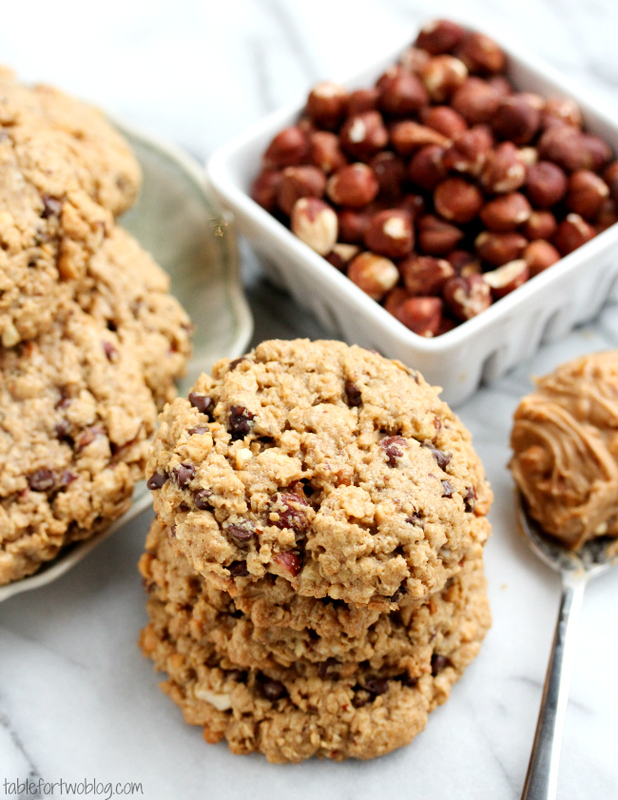 Love all those nutty flavors in these cookies! you have just inspired me to clean out my pantry. I may go totally wild and clean my fridge too! Also, whipping up a batch of these cookies is going on my to-do list as well. yum! 9 oz of pb in the batch?? now you’re talkin Julie!!!!! I would like a huge stack of these to get me through the rest of the work afternoon please. :) i love cleaning out my pantry. i’m obsessive about it. that’s why some of my recipes are so random. pantry cleaning! I wish you could have sent me all the stuff you took out of your pantry ;) I need to fill mine now. And of course, things are more expensive in Canada. Go figure. Ha. But I would be willing to spend the money to get the ingredients for these beautes! They look amazing!! Next time you get the urge to clean a pantry want to come help with mine?? :) It’s in such a sorry state right now… Anyway, love these cookies – they’re just full of delicious things! Correct, there is no flour. Seems odd, but it works! I actually did lick the screen (jk)! You make the prettiest cookies, Julie! I am the same way about my pantry. I just did that recently where I bought something and I came home it was in the back of my pantry. 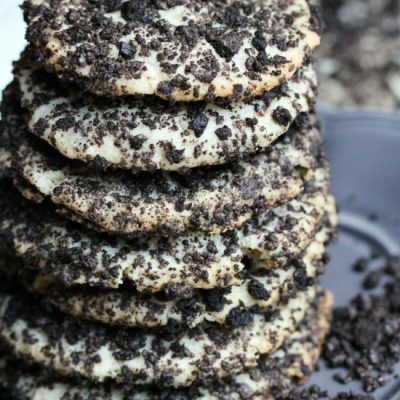 These cookies look like a great way to clean out the pantry! 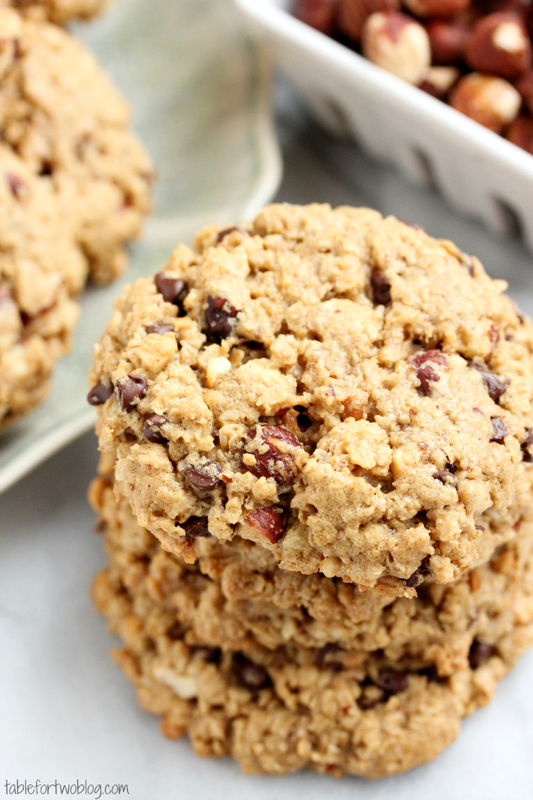 I love hazelnuts, oatmeal, and well, cookies in general, so these are on the must-try list for me!! These are really yummy!! I made mine a wee bit smaller than yours, but who am I fooling, then everyone just eats more of them ;) Thanks again for your earlier response. You were right, they just work! mmmmm I’ll take 2 dozen! I love those pantry raids. The scary ones are when you clean the fridge out and check the condiment dates. Yikes. Hazelnuts just aren’t used enough in cookies! I bet these were so yummy! I did something similar to my pantry last weekend – best therapy ever! I love hazelnuts. I do not eat enough of them! These cookies look delicious! I totally know what you mean Julie! Whenever I clean out my pantry I find oodles of stuff I didn’t know I had! I’m not gonna lie…I am waaay overdue for my next cleanout sesh. These cookies look delicious! I like that you used hazelnuts – they are way underused in baking! Couldn’t open the printer-friendly version of the recipe. My computer is NOT in the kitchen, so running back and forth between kitchen and PC is not the ideal solution, LOL! And if I print up the whole blog page, the Ingredients List is too small for these old eyes. Can you check the link, please? Hi Helen, it works fine on my end. If should pop up in a different window. Do you have popups blocked? I just finished making these and I literally ate 5 just standing! They are amazing!! I didn’t have hazelnuts so I used walnuts instead:) LOVE LOVE THEM!!!!! !